Published: July 19, 2015 • Modified: August 10, 2018 • by Author: Analida • Word count:531 words. • About 3 minutes to read this article. Chili powder is a breeze to make. But most people go to the store and buy it. Why not blend your own? It’s easy and you can adjust the heat accordingly. My chili powder experimentation happened out of need. Yes, necessity is indeed the mother of invention! I wasn’t planning on creating my own chili powder blend, but fate would have it otherwise. On one cold, winter Saturday, I decided to make chili. I started pulling out all the ingredients and soon discovered…GASP!!! I only had 1/4 tsp. of chili powder left. Go to the store? It was way too cold. I looked at the ingredient label, and realized that I had everything make my own. It will taste GREAT provided you use good quality spices. If you have paprika, cayenne, salt, oregano, thyme and cumin, you are in business. The proportions are up to you, however, your dominating spice should be paprika, followed by cumin. For my blend I combined smoked and sweet paprika. Cayenne is the heat gatekeeper. I think using allspice, nutmeg, or cinnamon give it a nice depth too. Chili is a multicultural concoction. Why? Oregano and thyme are native to the Mediterranean. Black pepper, India. Paprika is from the New World. Cumin, from Iran. 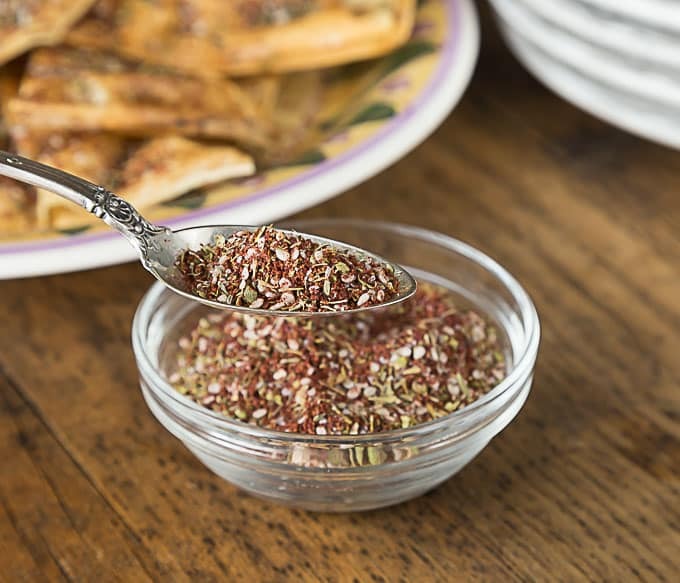 Actually, cumin dates back to ancient Sumeria, but that is the subject of another post. But, chili powder was actually invented in the American Southwest by German immigrant, William Gebhardt. He came with his parents from Germany to settle in the town of New Braunfels, TX. In 1892 he opened a café that served Southwest and German foods. He started playing around with Southwest spices. His blend: chili powder. The Gebhardt’s brand is still sold today throughout the US. 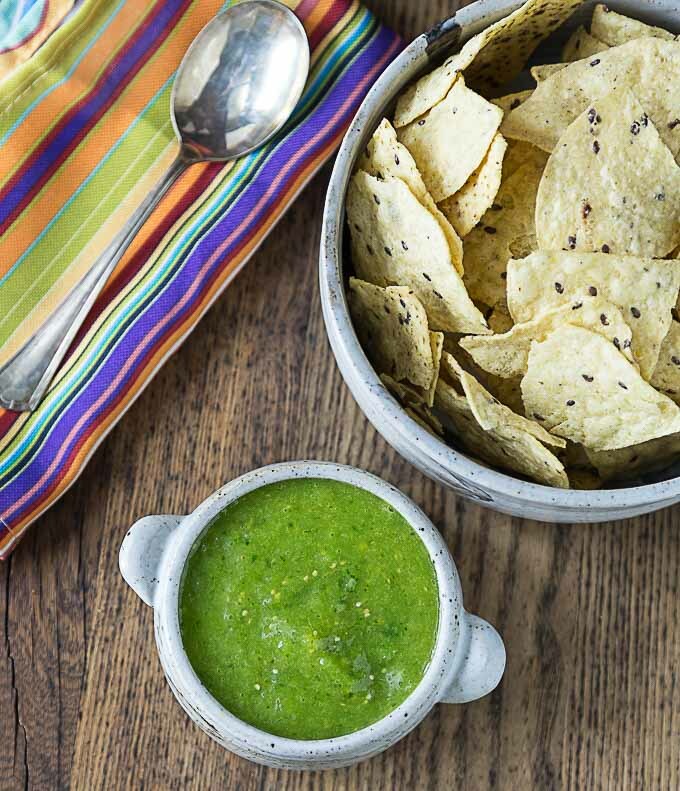 In 1908 he published what is probably the first book on Mexican Cooking. 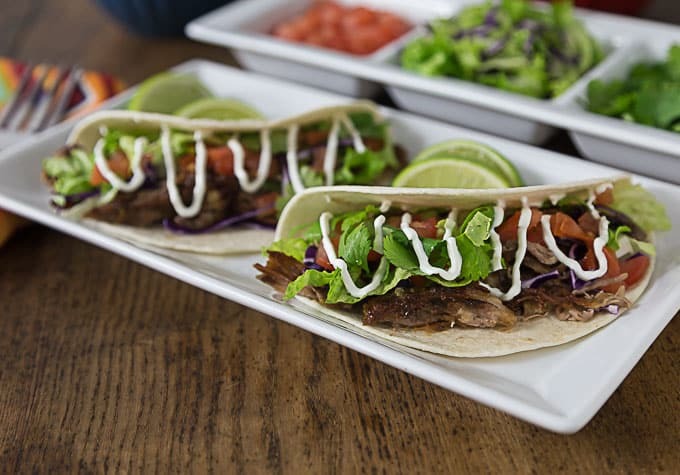 William Gebhardt is most likely responsible for making Mexican cuisine part of the mainstream American culture. I’m not one for heat. Feel free to double, maybe triple the cayenne if you like HOT. Use quality spices when blending. You’ll taste the difference. 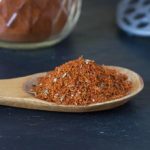 Chili flakes, cayenne, and paprika on their own are not a substitute for chili powder. 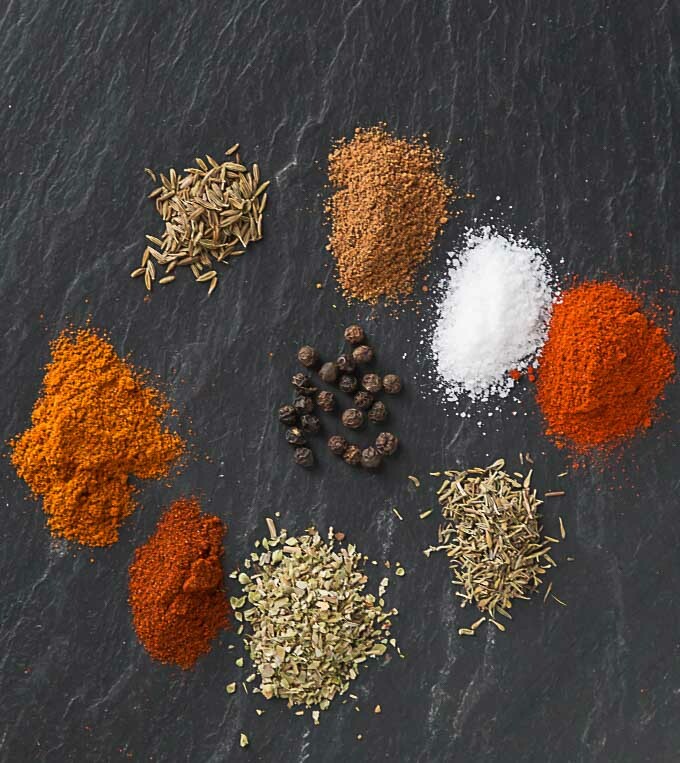 Solo spices won’t have the same depth of flavor. To make storage and pouring easier, I discovered my friends at reCAP, an awesome, local Erie, Pennsylvania company have come up with another perfectly practical product: The Flip Cap! 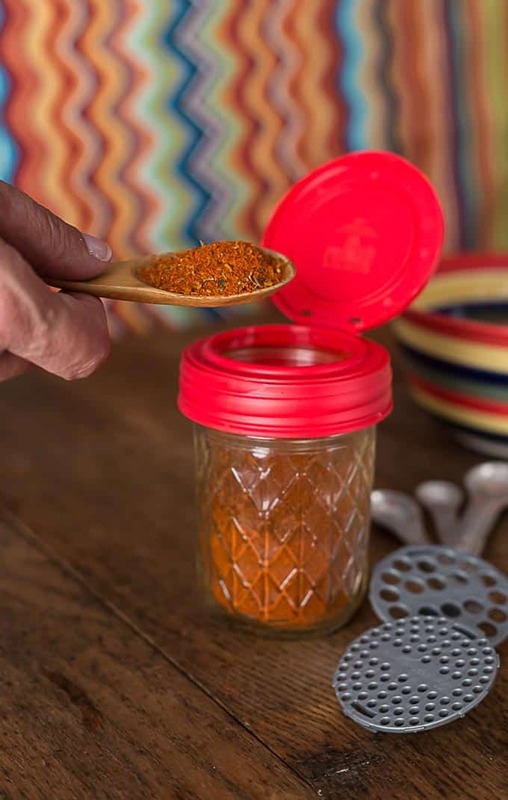 This will fit your Mason jars and comes with two grate inserts making dispensing a piece of cake. You can also leave the grate out and it’s perfect for spooning out spices as in the photo above. I LOVE this product. Let me know if you get around to making your own blend. I would love to hear from you. 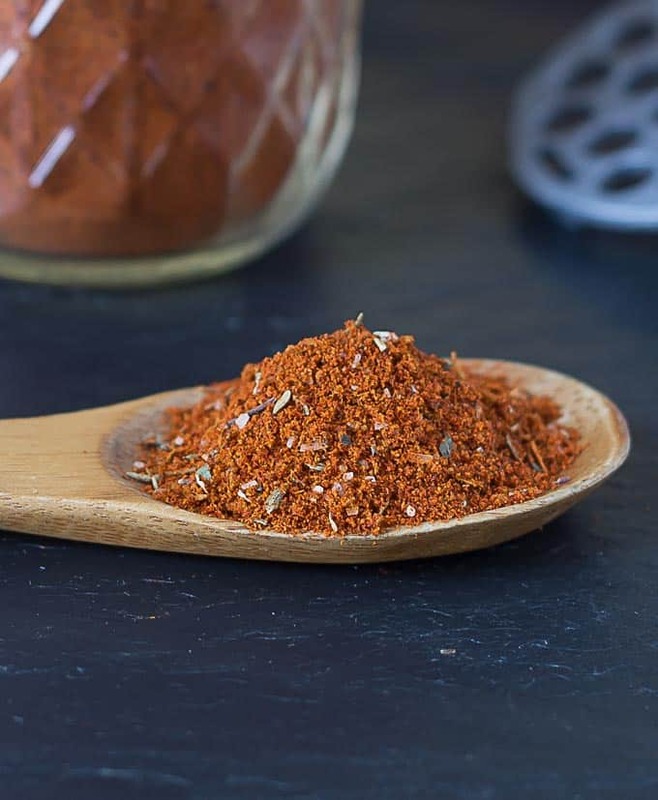 Make you own chili powder with this delicious recipe blend of spices. Place all ingredients in a glass jar and shake to combine everything. Cap it and store in a cool dry place. I know the owner of the company, she is a really nice lady. This is awesome, I definitely need to start making my own chili powder! Thanks Michelle. It’s very easy to make. You are welcome Hirra. I never realized how easy it was to make. Now you’ll never have to buy it again. Better yet, you can customize it to your own taste. I have been trying to make more of my spice mixtures myself instead of buying them at the store and this is perfect to add to my list! Thanks for linking up at the Bloggers Brags party, I pinned your post to our group board. I am also working on two more: curry and Thai seasoning. Thanks so much Nancy. I will certainly visit your blog. I am also passionate about environmental issues. I love homemade spice combinations. And as you point out, chili is not a single spice but a combination. Can’t wait to try your formula. Thanks, Laura. Try it out. You’ll never want buy chili powder in the store ever again. I also encourage you to experiment by adding a tad of this or that! Have fun and let me know how it turns out. I am trying to duplicate “Gebhardt” chili powder. I do not know what variety of ground chilis are indicated. Can anyone help? That might be a closely guarded secret but my blend uses a couple types of paprika and the bringer of the heat: cayenne. I hope this helps. How much of the blend per standard pot of chili…1# ground beef, 1 can tomatoes & 1 can red beans?? BTW, it smells amazing!!! I just mixed it up! I would use 1 tablespoon in this size batch of chili and while it is summering check the spice level. If you need a little more feel free to add to taste. Thanks!